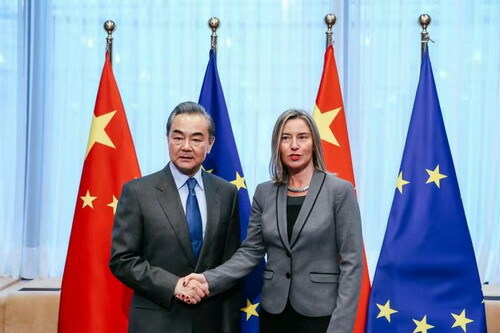 On March 18, 2019 local time, State Councilor and Foreign Minister Wang Yi and the European Union (EU) High Representative for Foreign Affairs and Security Policy Federica Mogherini co-chaired the ninth round of China-EU High-Level Strategic Dialogue in Brussels. Wang Yi expressed that China and the EU are comprehensive strategic partners. Facing the turbulent international situation, the two sides have carried out fruitful communication and cooperation, playing the role of "stabilizer". This is also a historic responsibility that should be taken on by China and the EU, two major forces in the world. The level and scale of bilateral cooperation are at a historic high, and there is still great potential. The two sides should continue cooperation, adopt problem-solving orientation, constantly explore and expand new methods, new areas and new impetus of the four major China-EU partnerships featuring peace, growth, reform and civilization, and push the comprehensive strategic partnership between China and the EU for constant and in-depth development. Wang Yi underlined three points: Firstly, cooperative partnership is the nature of China-EU relations. The common ground is to value the development of bilateral relations, although the two sides have differences on some issues. There is no essential conflict of interest between China and the EU. The two sides can seek common ground while reserving differences, but also consolidate the common ground while resolving differences, constantly expanding the common interest and perception. Secondly, the goal of China-EU cooperation is to achieve mutual benefit and win-win results. It is hoped that Europe will be the first to benefit from the new round of China's reform and opening-up. The European side is welcome to participate in the construction of the Belt and Road Initiative, and conduct the effective integration between the Belt and Road Initiative and the EU's Europe-Asia connectivity. Thirdly, the respect of each other's core interests is the mark of the trust between China and the EU. It is hoped that the EU side could be discreet in words and deeds on issues concerning the Chinese side's core interests. The Chinese side is willing to work with the EU side to continuously well maintain and develop bilateral relations, benefit the people of the two sides, and make more positive contributions to the world's peace and development. Federica Mogherini said EU-China relations have reached a new high in the past five years in terms of the depth and extent. The two sides share common stance and goal against unilateralism and protectionism, and both sides support the international order with the United Nations as the core. For the first time, the Chinese Foreign Minister will hold a group meeting with the foreign ministers of the 28 EU countries, and they will further discuss about strengthening the EU-China cooperation. The EU side has always regarded the Chinese side as an important strategic partner, valuing China not only economically but also politically. The EU's new document on policy towards China will not replace the current EU strategic cooperation with China. The EU has no intention to impede the development of China, and it is impossible to do that. The EU is willing to see a bigger leading role played by China on global issues. The EU has differences with China in some issues, but has always looked upon the bilateral strategic partnership from the perspective of common development and prosperity. The EU side will continue sticking to the one-China policy without any change. Federica Mogherini expressed that the EU side stands ready to, together with the Chinese side, push for the implementation of international multilateral agreements, and carry out close cooperation on topics including the Paris Agreement on climate change, Joint Comprehensive Plan of Action on the Iranian nuclear issue, sustainable development goals, and African development. The EU is willing to deepen connectivity with China, discuss the integration between the Europe connectivity strategy and the Belt and Road Initiative, and vigorously carry out third-party cooperation. The EU hopes to strengthen the security and defense cooperation with China, which is not targeting any third parties. The two sides can cooperate in cyber-security, safeguard the openness, safety and stability of the internet, and establish an order in cyberspace based on rules. The two sides also exchanged in-depth views on the current international situation, the respective relations with major countries, and international and regional hotspot issues.